The majority of visitors to Facebook and YouTube already use a mobile phone or tablet (or both), according to the latest cross-device audience data from research firm, Roy Morgan Research. And Ebay is not far behind. The company found almost 13 million Australians visited Facebook in an average of four weeks – in the 12 months to March 2015. This statistics is up 10 per cent from 11.8 million in the year to March 2013. In addition eight million of those visitors (68 per cent) use a mobile device—a phone, a tablet, or both—for some or all of their site visitation. This is an increase from five million (45 per cent of total visitors) two years ago. Seven million people now use a mobile phone to access Facebook during an average four-week period (up 59 per cent from four million in early 2013) and almost four million use a tablet (more than double the 1.8 million visitors via tablet two years ago). And of these mobile visitors, more than two million go to Facebook via both types of device during the month. The way YouTube is visited is also changing. According to Roy Morgan Research, this is helped along by the increasing mobile data allowances available for streaming video on the go and the rising trend of multi-screening on the Wi-Fi connection at home. The study also found that from March 2013 to March 2015, YouTube’s net monthly website audience grew 14 per cent to almost 11.8 million. Most of these video streamers now use one or more mobile devices during the month. Three million use a phone, a million use tablets, and another 1.5 million use both. As for Ebay, its total four-week audience remains unchanged over the last two years, increasing by less than one per cent to 7.3 million. As with Facebook and YouTube, its visitation via mobile device has increased by 17 per cent from about two million to 3.4 million. 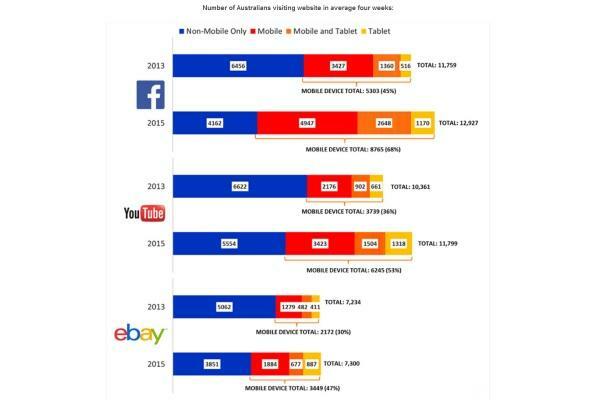 However, this means that the remainder of Ebay visitors still use only non-mobile computers to access the website. “It’s astounding how quickly the last two years of rapid smartphone and tablet uptake has influenced cross platform, cross device visitation to Australia’s biggest websites,” Roy Morgan Research media general manager, Tim Martin, said. “The changes in cross device visitation that we’re seeing are consistent with the rapid shift of online display advertising from non-mobile to mobile formats. Advertising campaigns that would previously have been shown on desktop computers are now being adapted for mobile formats,” he added.